and Technology, Govt. of India. 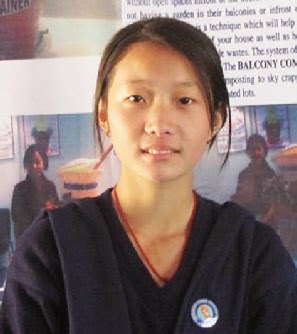 Nani Oniya, daughter of Nani Tatung and Nani Yassey, a student of Class-X of VKV School, Ziro has brought laurels for the Ziro in particular and state as a whole by winning in 2nd National Level Exhibition & Project Competitions, 2012. In honour of her achievements, the Ziro VKV school authority has organized a photo session programme on Tuesday where Oniya shared her experience. “In the year 2011, when I was in class IX, my class teacher informed me of the district level exhibition competition particularly for those who stood first position in class-VIII & Class-IX exam. As I have passed Class VIII in first position, I along with the topper of class IX, who is now in class X, were selected for participating the district level INSPIRE competition. Accordingly, under the guidance of our teachers, we were participated the competition and stood topper and selected for state level competition,” said Oniya. As state level was schedule during our school vacation, my mother accompanied me to Itanagar for taking part in the competition. In state level too, the model presented by me had impressed the judges. However I stood in 6th position. As per Govt. of India instruction, the State level competitors of upto sixth ranks could participate the national level INSPIRE competition. As such, I prepared for the national level. Finally in the month of November this year, the national level competition was held at New Delhi where I presented a model on ‘Balcony Composting’ with a theme: Science, Society and Environment and with sub-theme ‘Agriculture’. Impressed on my innovative model, the judges selected me as first for the Arunachal Pradesh. Selection of the rank is awarded amongst the participants of a state but not on national basis. Accordingly, I was awarded first prize for Arunachal Pradesh in 2nd National Level Exhibition & Project Competitions-2012, she added. After narrating details of her participations, she expressed her gratitude to principal and teachers of VKV, Ziro and her parents for the valuable guidance and inspiration which helped her to win the award. Overjoyed with the success of Oniya, Anand Mohan Mishra, principal of the school said that they will produce more Onyia from his school for bringing more laurels to school in near future. He wished that Oniya brings more innovative for presenting in international level in future. Later, while displaying the model presented by Oniya at New Delhi, Principal explained in brief on importance of “Balcony composting”. Gardening is one of the hobbies that bring you close to the nature or environment. Today the cities are growing fast and space around us is decreasing. Though you are interested in gardening, you may not have land to practice it. So, the Balcony Gardening with the help of composting kitchen refuse in balcony may help you to practice.